Happy New Year, friends! I hope your new year is off to wonderful start. Ours certainly is! We are still reeling from the magnificent time we had in New York (details below). Additionally, I had a PET scan last week...the scan did not show any signs of cancer growth or progression! Praise the Lord! We are breathing some BIG, BIG sighs of relief. My next scan will be in early April, and every three months thereafter until the cancer is detected again. In the meantime, I am absolutely enjoying the break from treatment and getting stronger with each passing day. I still get tired easily, but I feel great. My hair is starting to grow back and I’m acclimating to having hearing aids. Some of you have asked if my hearing loss from chemotherapy is permanent…yes, unfortunately so. I can still hear though (even if it's not well), and for that I’m truly thankful! While I have significant general hearing loss, I also have a loss in clarity of sounds. As a result, much of what I hear sounds very distorted. As aggravating as that can be, it does make for some interesting conversations and lots of laughs. So, be warned, friends…if you have a conversation with me on the phone or in person, I may just put words in your mouth! HA! Speaking of words..in addition to new year’s resolutions, it's come to my attention that at the beginning of a new year some folks like to choose a word to focus on for the year. I’ve pondered what my word should be. So many words seem appropriate, but one stands above the rest. Hope. So much has changed over the past few months that some days I don't know if I'm coming or going. Yet in the midst of all the instability and uncertainty there is something that has not changed...hope. I have hope. Beyond that, who knows? I mean, life can change in an instant (for reals! )…for any one of us. We expect to pull out of our driveway each morning and head down the road to another mundane, routine day…but, sometimes, the road gets slickery and we find ourselves slipping and sliding down a path we never intended to travel. And, heck, perhaps never even saw coming. No matter what road we’re on though – there is hope - an unwavering, firm and secure anchor for our soul. The light at the end of the tunnel. Not dependent upon situations or circumstances, hope reminds us better days are coming and that they will come! For me, hope is faith. It’s love. It’s grace. It’s mercy. Hope is Jesus. He is the reason I can keep my head above water. He is my peace…the provider of my strength, and my joy. He, my hope, does not disappoint, and in Him I choose to dwell. I will not dwell in the fear of my diagnosis or of what may come. The ground is too shaky there, and it's awfully hard to stand on shaky ground. Hope...that's my focus. Hope steadies my stance. It's my word for the year, and Jesus, my hope, is my word and focus for life. As I mentioned above, we had a magnificent time in the Big Apple! 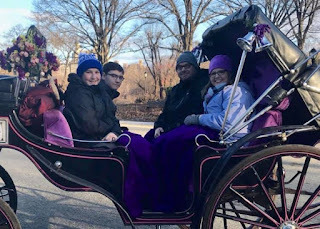 We were able to visit NY for a few days right before Christmas and thoroughly enjoyed ourselves. In addition to the Stella’s Wish Foundation, many additional people came together to bless our family and offset the costs of the trip. We are so very humbled and grateful for the kindness bestowed upon us. The Christmas lights and decorations in New York were simply beautiful! 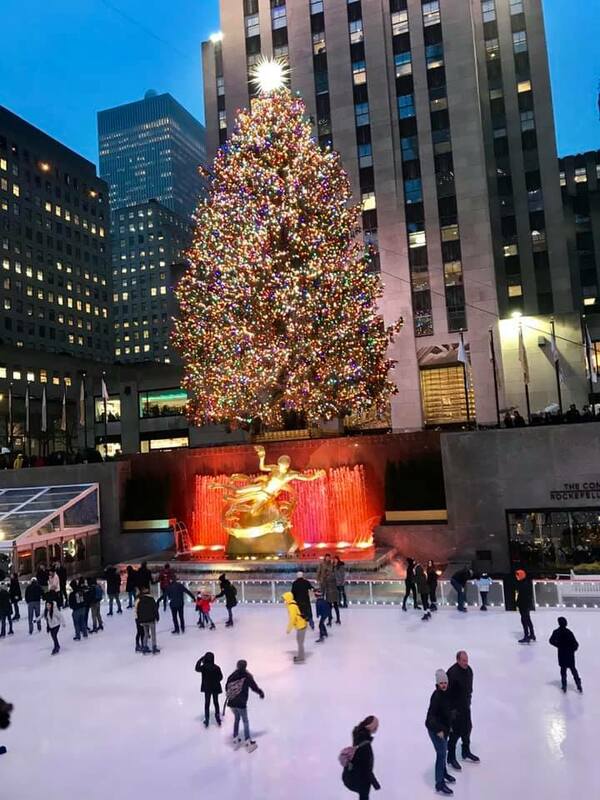 I loved seeing Times Square, Central Park, Rockefeller Center (and the gorgeous and HUGE tree there! 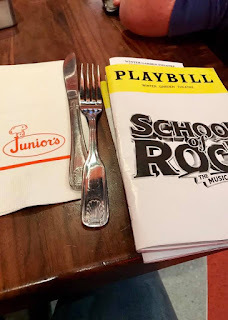 ), the Plaza Hotel, the Statue of Liberty, the 9/11 Memorial and Museum, a Broadway show (School of Rock), and so many of the other sites I’d only prior witnessed on TV, in movies, or online. 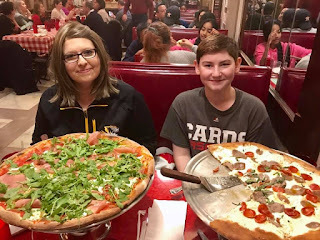 We feasted on pizza, hotdogs, and cheesecake, of course, and soaked up every bit of the sights, sounds and tastes of the city as possible! More important than the trip itself though was the gift of time with one another. That was the greatest and most wonderful gift of all. 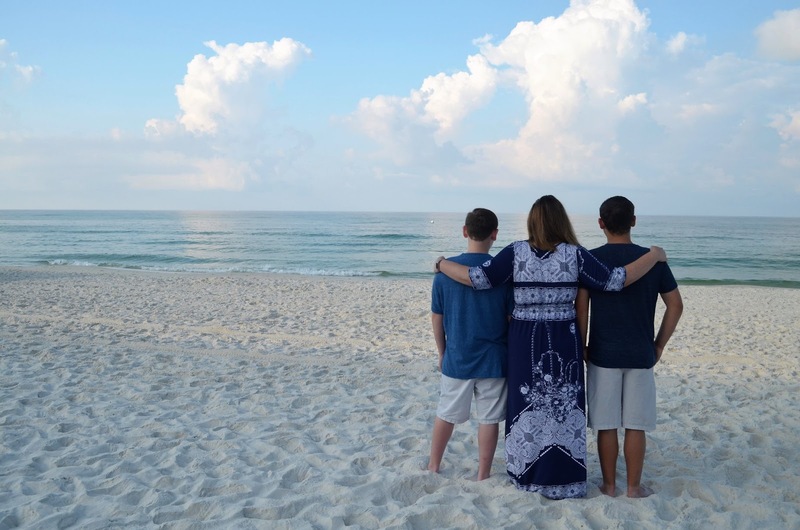 I cherish the moments, now more so than ever, that I am able to spend with Todd and our boys. So, THANK YOU for an amazing trip filled with priceless, lifelong memories and time with my family. 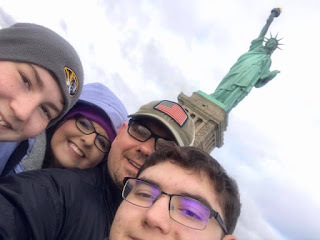 Below is just a few of the photos from our awesome trip. May your new year be filled with all the joys, blessings and peace that Hope brings! It was springtime in Missouri, nearly Easter as a matter of fact, when Todd and I went on our first date some twenty seven years ago. We saw the movie, Home Alone. Though the movie had come out months prior it took a while for it to reach our theater in small town Missouri. We found it quite amusing to watch a recently released Christmas movie at Easter, yet the timing was perfect...the best, actually. It was a moment made just for us - the start of our beautiful relationship, and a special memory we'll always cherish. I’d love to tell you I am patient in all things and with all people, but there would probably be a be lump of coal in my stocking if I did! What I can honestly tell you though is this –God specializes in timing – even if it means seeing a Christmas movie at Easter. His plan for our lives is always perfect, always best, and always provides exactly what we need right on time...every time. While Home Alone holds a special place in my heart and Todd’s, it also holds a special place in the hearts of our two boys as well. Every year the four of us watch the Home Alone movies together while putting up our Christmas tree. 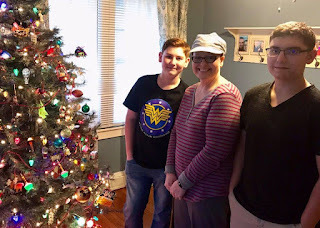 I hope the boys continue that tradition years from now when they put up their Christmas trees with their own children; and I pray they'll fondly look back on these times we've shared and remember how much they were and are loved. 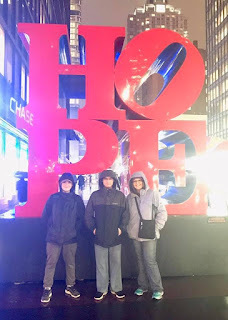 I treasure my opportunities to connect and make memories with my family; even more so now - as the boys get older and as we face my cancer diagnosis. Life goes by quick and time spent with my husband and our boys is the best, most precious gift ever. 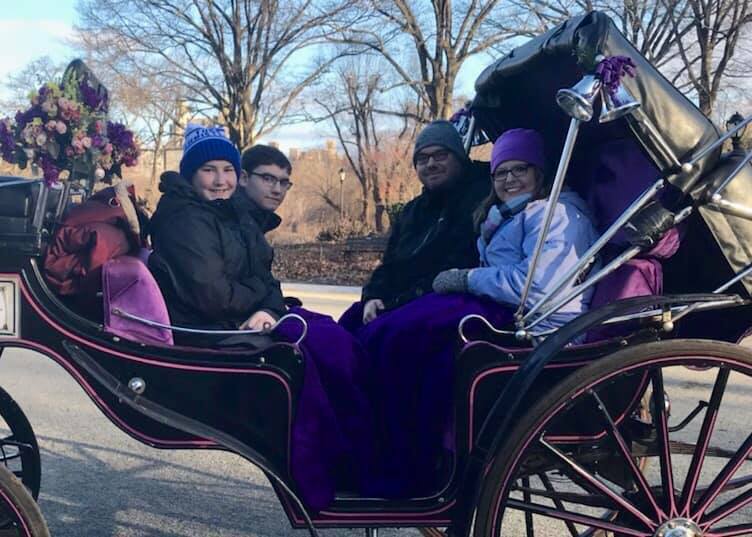 Recently, I submitted a wish to the Stella’s Wish Foundation, a foundation which grants wishes to adults with stage IV cancers. For nearly a month I wrestled over whether or not to submit a wish. I wondered if it would be selfish. Afterall, our family is certainly not the only family in the world dealing with the dark cloud of cancer, and so many, many others are far worse off than us. Submitting a wish also meant facing the reality that I meet the requirements to even do so, and that, quite frankly, is a hard reality to stare in the eye. But, I knew what I wanted, and I also knew I wasn’t going to be able to make it happen on my own. I desperately wanted to give my family the best Christmas ever. So, I prayed, "God give me what is best... whatever that may be", and I submitted the wish. The foundation receives 60 to 100 wishes every month. I am no more deserving than anyone else to have my wish granted. I am also keenly aware that just because we want something that doesn’t necessarily mean it’s the best or right thing for our lives at that time. I’ve learned that wanting the best thing in my life and the life of my family means I’m praying, trusting and asking God for that best thing. There was no guarantee my wish would be chosen and I was okay with that. Again, my desire was for our family to receive the best thing – even if it was no thing at all. The wish… New York City at Christmas time. We’ve never been to New York, but thanks to Home Alone 2 seeing the city at Christmas is something we have long wanted. 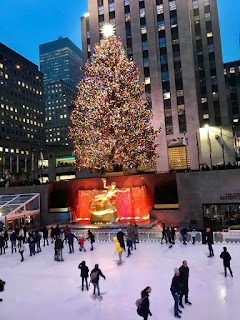 The movie, set in New York City, has many scenes depicting the grandeur and magic of the Christmas decorations which adorn the area. 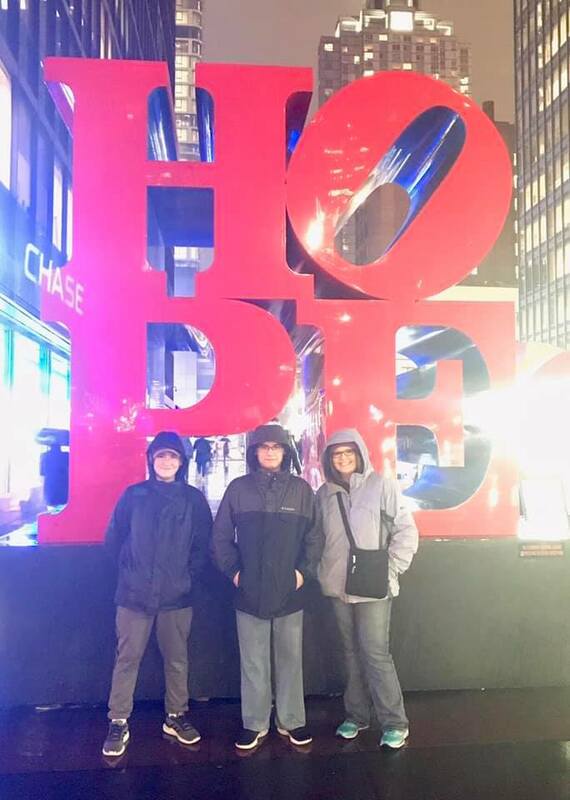 Further, prior to my diagnosis I made a promise to my boys that I would take them to NYC before they graduate high school. We are so fortunate in our country to have many memorials and monuments which provide us the opportunity to pay homage to those who’ve gone before us and serve as reminders to pause and appreciate the freedoms we enjoy in our great nation. It has always been important to me to make sure my children see some of these important and reverent sites and to teach them to respect the men and women associated with those sacrifices and freedoms. New York City is among the cities having many such memorials and monuments. Early last week, I got a call from Stella’s Foundation. We will be leaving for New York soon. My heart is humbled and full of gratitude. Thank you, Lord. It will be the best trip ever. **Many thanks to the Stella's Wish Foundation for honoring my wish. You can read more about the foundation and Mrs. Stella by clicking the link. 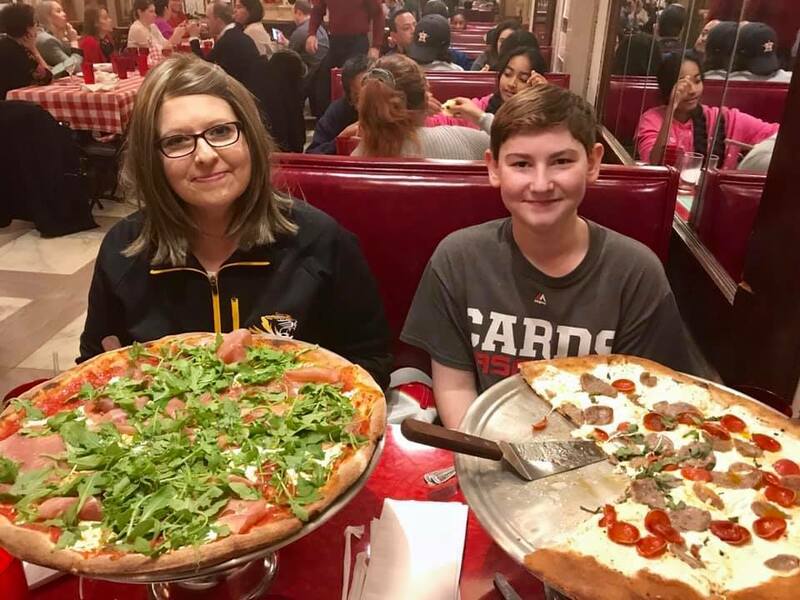 We are grateful for Mrs. Stella's legacy and the difference she and the foundation continue to make in the lives of many families such as ours. Last week we completed round 5 of 6 rounds of chemo. The further we get into the treatment, the harder it becomes. Chemo has a cumulative effect, so each round builds on the previous one and the side effects often become stronger and more frequent. We’ve certainly noticed. My stamina has decreased significantly and my stomach pain has increased. I’ve been spending a lot of time sleeping and taking more days off of work to rest. Finding balance has been tough, but we are hanging in there, and reminding ourselves to take one day at a time. It’s so easy to get discouraged through this journey, and admittedly, there are days that I truly just want to stay in bed and cry. I know that’s a normal response, but not one of which I’m particularly fond. I suppose I thought I would breeze right through chemo and it would only affect me as much as I allowed. Boy, was I wrong! Daily I am reminded it’s not my own strength that will get me through this, but Christ’s strength in me. Some days I do a better job leaning into His strength than others though. I pray my witness and testimony continue to shine through – even on the hard days. We are so very appreciative of all your prayers and encouragement, meal deliveries, cards, hugs and thoughtfulness to our family. It means a great deal to the four of us and we are incredibly blessed with so many caring, kind friends and family. Next week I will complete my final round of chemo. It will be a bittersweet ending. The fatigue and stomach pain will eventually fade and my hair will start to grow back. Some of the side effects won’t go away, however. Recently, we learned that the chemo has caused severe hearing loss in both of my ears, and I’ll be fitted for hearing aids soon. Thankfully, I haven’t lost all my hearing, nonetheless, the hearing loss is a hard pill to swallow and another new normal to which we must adjust. Sometimes, learning to balance involves a whole lot of wobbling until our gait is steady again. And, right now, I feel like a wobbly, hot mess. We also know that the chemo has been effective in shrinking the tumors and slowing the growth of the cancer. What a blessing! When I finish my 6th round, chemo will no longer part of our treatment plan and the cancer will eventually start to grow again. When that will happen is anyone’s guess, but we are encouraged that about 40% of patients tend to go one to two years without growth and the need for additional treatment. We pray that is the case for me, plus some! When the cancer does grow again, however, immunotherapy will likely be our next step and then ultimately clinical trials. There is strong likelihood the cancer will be what takes my life, but we also know that none of us are promised tomorrow. I am so thankful for my faith and the confidence I have in knowing that when my time on earth is through, whenever and however that may be, I’ll be rejoicing in Heaven. And, I guarantee there’s balance there! As I close out this update, I would ask that you continue to remember us in prayer. Specifically, I ask that you lift us up as we contemplate important decisions for our future. Many patients with stage IV bladder cancer file for disability. We’ve started some difficult conversations in this regard and for now are still gathering facts. The timing of when to file is weighing heavy on our minds and shoulders. Please pray that we would be wise and at peace with our decision. 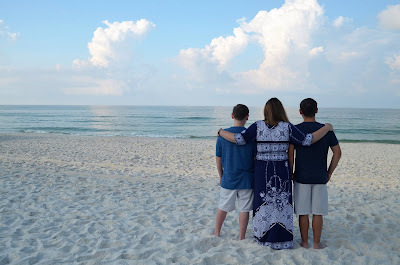 The Florida beaches along the Gulf of Mexico are one some of my most favorite places to visit! The soft, sugar white sand and turquoise water. The lullaby of the tides that eases weary souls and minds to stillness and rest. The breathtaking sunrises and sunsets. Serenity now! I love every. single. bit of it. Just a few weeks ago, my family took a trip to one of those beautiful beaches. What a blessing it was to spend moments together making priceless memories. At the time, we were waiting in the wings for news of whether or not I had cancer. Having already received the results of some of my scans, we knew the possibility of cancer was a very real one. But, having gone through cancer before, we are/were also all too familiar with riding the waves of survivorship. Sometimes, there are scary test and scan results that turn out to be nothing at all. We've learned it's imperative to find balance while riding the waves, and that balance requires a steady footing. Sometimes that is much easier said than done, but regardless, without it, we find ourselves overwhelmed by the waters. One morning during our vacation, we got up early to take family photos on the beach. Thanks to my sweet husband, who also served as our photographer, we were blessed with many great photos. One of those photos, however, speaks to my heart the most. It’s a photo of me with my boys gazing out at the vast waters before us. Like the stillness of the ocean in the photo that morning, sometimes the waters in our lives is calm. Other times, as we all know, it’s full of many unexpected waves…some waves will be breathtaking and wonderful and some will hit your heart so hard you don’t know if it will ever be able to beat again. But, for every wave that crashes, my faith in Christ will stand. He steadies my footing. He calms the waves. This past Monday I received my first chemotherapy treatment. I am feeling well, just riding a few waves of nausea and fatigue. But, God’s got this. And, He’s got me. And, for whatever waves you’re facing, He’s got you too. I’ll close with the lyrics from the song, “Oceans (Where Feet May Fail)” as performed by Hillsong United. Confession: I am somewhat technologically challenged! I had hoped to upload a video here to the blog page, but it appears the file it too large to do so. So...if you feel so inclined, I would love for you to visit the Facebook page for the blog and watch the video there. Our family is embarking on a new chapter and we would so love for you to continue walking The Slickery Road of life with us. I will enter His gates with thanksgiving in my heart. I will enter His courts with praise. I will say this is the day that the Lord has made. I will rejoice for He has made me glad. It is the day after Thanksgiving, and my family of four is slowly rising this morning, one by one, from our Thanksgiving slumber. Our bellies and hearts still full from the copious amounts of food and love we feasted upon yesterday. Thank you, Jesus for family, friends, pumpkin pie and whipped cream…but, mostly Lord, thank you for stretchy pants. Amen? Amen. “There is always, always, always something to be thankful for”. I placed a sign with that phrase on my dining room wall a few years back. It serves as a daily reminder to me (and I need that reminder) that thanksgiving is so much more than a holiday. It’s a place to enter and abide - a place where hearts are stretched and filled with life, goodness, grace, abundance, and joy. It’s totally our choice to binge and reside in that place of thanksgiving though. And, it’s not always easy to do so, especially when life is full of circumstances beyond our control. The circumstances themselves, hard as they may or may not be, are not nearly as important as what we opt to do with them. Praise God He is our hope! I am thankful. The past six months have no doubt been wearisome and many times I’ve felt at the end of my rope. There have been moments my face has been so hot from tears, stress, and anxiety that I wanted to stick my head in the freezer – thinking the cold air would somehow manage to keep me from spontaneous combustion. I have been hard pressed, crushed, perplexed, struck down…but, I’ve not been abandoned. I’ve not been destroyed (2 Corinthians 4:7-9). God’s power is alive and well in me and because of Him I can keep showing up…facing each day with a thankful heart. I may feel at the end of my rope, but I’ve never been at the end of my hope. We’ve ruled out many things, but we’re still searching for a cause of my health concerns and symptoms. Tuesday I will undergo a kidney biopsy. My physicians now considering lupus nephritis as a potential culprit. Your continued prayers are much appreciated. I don’t want to go through the biopsy. Sitting at home in my stretchy pants and eating pumpkin pie sounds like a much more fun and exciting way to spend the day. But this, this is the circumstance I am in. And, the circumstance itself is not nearly as important as what I opt to do with it. I’ve been reading lately the book of 2 Corinthians. It is chock-full of reassuring, comforting, God breathed words spoken and gifted to us through the Apostle Paul. Paul penned the heartfelt words of 2 Corinthians around the time period of A.D. 55-57. It blows my mind that something written that long ago is still completely applicable and appropriate for today. God is good. He always knows just what we need at the exact time we need it…even if it’s more than a thousand years later. He’s pretty awesome like that. The focus of Paul’s message was Christ, not himself. He wanted others to see Christ’s work in him, and he fully acknowledged that his abilities, his strength, and his accomplishments were not the result of anything he himself could do, but rather what Christ was doing in and through him. Preach. In 2 Corinthians chapter 4 Paul writes that those who love the Lord are like jars of clay – frail and fallible. Yet, despite that frailty, they are jars filled with the priceless treasure of Christ’s power dwelling in them. You guys - I am a jar of clay, frail a fallible, but God is alive and well, and He is at work in and through me. What an honor and privilege that is! Sometimes I just need that reminder – a kick in the old stretchy pants, so to speak. If there is but one thing you take away from reading this blog, I pray it is this – God’s saving, all consuming, merciful, powerful grace. He is my hope. My strength. My power. My salvation and my song. It is because of the strength I find in Him I can even remotely begin to have a heart of thanksgiving. A heart that overflows for His glory (2 Corinthians 4:15). Because of Him, in the midst of unmet expectations and unanswered prayers – there is appreciation. On those days when my chin quivers and my eyes fill up with tears – there is gratitude. Because, there is always, always, always something to be thankful for. I will choose to enter His gates with thanksgiving in my heart. I will choose to enter His courts with praise. I will choose to say this is the day that the Lord has made. And, I will choose to rejoice for He has made me glad. I will be seeing a kidney specialist in a couple of weeks to determine whether kidney disease is the culprit of these ongoing health concerns. The symptoms that started five months ago are still very much present. So, while we are rejoicing over the absence of a cancer diagnosis, we continue to wait with anticipation for answers. Each day I’m learning to lean more and more on the grace and goodness of the Lord...trusting in His timing and His plans. Desperately trying not to run ahead and control things myself. I know His ways are better than my own. And, because of that I’m so very thankful that He loves me despite myself and despite my failures in leaning on Him as often as I should. More of Him, less of me. I’m learning to lean. This learning to lean thing is hard. It’s truly a daily decision...sometimes it’s a minute by minute, or even second by second decision. We, as a society, are so accustomed to instant gratification that any amount of waiting or not getting exactly what we want can often lead to tantrums of toddler like proportions. Bless. Trust me when I say I could easily be mistaken for Veruca Salt’s understudy in Willy Wonka and the Chocolate Factory. And, she was a bad egg, my friends (Check it out here). Thank God He doesn’t always give us what we want, but He is oh so faithful to meet our every need. He saves us over and over and over again; steadying our stride and reminding us to lean. For goodness sake, He’s the creator of the universe. So, um, He's perfectly capable of handling the hot mess we are, no? Mercy. That gets me right in the feelers. We can study, and even memorize the entire Bible. We can be Bible scholars (and heaven knows there are many scholars out there who can quote the Bible from cover to cover) but, without application of what we know and learn from scripture – all we have is...knowledge. Being smart is good. Being wise is greater. If we aren’t applying God breathed instruction to our lives, then God's word is nothing more than a bunch of useless information floating around in our big ol’ brains. Let me be perfectly clear here, I don’t share with you as an expert on this subject by any means. I’m just a girl longing to serve and honor the Lord, working out her salvation each and every day. If my sharing is helpful to you along your spiritual journey, then I am ever so thankful for the ability to share. But, hear me when I say - Praise God His mercies are new every morning. Cause, you guys, I need some mercy. For reals. I can’t even tell you how many times, in the last week alone, I have laid down my crown at the feet of Jesus just to pick it back up again seconds later. The Lord has proven Himself faithful time and time again in my life. I could talk till I’m blue in the face of His providence. I have no reason to doubt Him. I know His plans are best, but living out what I know...sigh. That’s where the rubber hits the road, and I’m like a teenager learning to drive. Jesus take the wheel. Each day I’m learning to loosen my grip on my own agendas, my friends, food (props to Reese’s peanut butter cups), music, retail therapy...you name it - whatever or whomever I’m leaning on for temporary satisfaction and security in place of the One who grants eternal satisfaction and security. I’m learning...learning to lean on Jesus. Running after instant gratification is such an easy mistake...it takes us off of the perfect, individualized path God has designed just for each and every one of us. And, it’s a trap that I (and I pray you do too) know better than to fall into. The more aware we are of the traps and snares, the greater chance we have of avoiding them in the future. I liken this to my boys’ math homework. Todd and I require the boys do their homework as soon as they get home from school. It has to be done before they can watch TV, get on the X-box, or whatever else their little hearts desire. I can’t tell you the number of times I have graded their math homework and found careless mistakes. They know most of the answers, but make errors because they aren’t focused on their work. Instead they are in a hurry to get that temporary high of playing games or watching a show. So, they rush to the finish line and end up getting off track – only to find they saved no time at all and have to go back and correct mistakes that shouldn’t have been made in the first place (at which point whining ensues on their end...and mine. Algebra gives mama a headache). Slow and steady wins the race, but often we are too concerned with satisfying our desires that we run ahead and end up taking a detour down the wrong path, tripping over ourselves along the way. Have I mentioned I trip a lot? In the hurdles of life, we find success, joy and peace when we lay aside our own plans and expectations—and surrender to His. His pace. His path. His answers. His plans. The wisest man who ever lived, Solomon, wrote the book of Proverbs. He also wrote the books of Ecclesiastes, and the Song of Solomon. In these books, Solomon shares his wisdom with readers. But, Solomon wasn’t wise by his own merits or doing – his wisdom came from the Lord. Solomon literally prayed for it, and God, in His great faithfulness, granted it to him (2 Chronicles 1:7-12). In Proverbs 1:7 (NIV), Solomon wrote, “The fear of the Lord is the beginning of knowledge, but fools despise wisdom and instruction.” Knowledge is plentiful. But, wisdom, wisdom is scarce. Wisdom requires putting into practice what we know, not just taking charge and running full steam ahead. Everyone is looking for a source of strength. We can choose to lean on ourselves, on others, on things, or...we can lean on the everlasting arms of Jesus. Our human understanding always limits God. Learning to lean on Jesus - to depend, rely, and rest on him is a crucial part of our spiritual journey. May we seek His wisdom as we run with endurance the race He has set before us.